At 13, Kirby Dach stood out as a potential superstar. 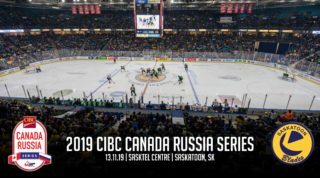 Now, with the 2017-18 WHL season around the corner, he steps in looking to become the cornerstone for the Saskatoon Blades. Joining bantam hockey younger than most when he was only 12, Dach quickly made a mark in his second season. He posted a remarkable 100 points (29 goals, 71 assists) in just 33 games as a member of the Fort Saskatchewan Bantam AAA Rangers. He then earned a spot with the Fort Saskatchewan Rangers Midget AAA squad in his WHL Bantam Draft eligible year. That’s definitely not something you see every day. But Dach wasn’t done pushing the boundaries, as just last season the then-15-year-old was given his biggest opportunity yet: the chance to have an extended stint with a WHL club. Under normal circumstances, a 15-year-old rookie is only allowed to play five games with their WHL club before the end of their Midget club’s season. 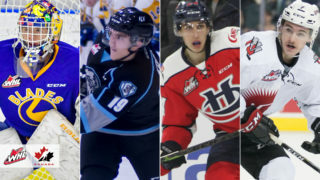 However, a run of injuries to the Blades’ offensive corps in February led to the WHL granting the team special permission to call up the young superstar for the remainder of the season and playoffs. Naturally, Dach made every minute count. It didn’t take long for the Fort Saskatchewan, Alta. native to make his mark in the big league. Just 26 minutes into Dach’s first game as a full-time Blade, Libor Hájek sprung Dach with an outlet pass and the rookie made no mistake, going forehand-backhand-top shelf for his first WHL goal. Eight minutes later, he was at it again, this time notching an unassisted marker for the game-winning goal. He earned a first star selection for his efforts. “It was pretty good to score those goals. It felt really good at the time, I couldn’t stop smiling or anything. It was something I’ll never forget for sure,” Dach said, while also noting that he wouldn’t have been able to score them without the help of his teammates. But the 6-foot-3, 181-pound centre wasn’t done scoring. 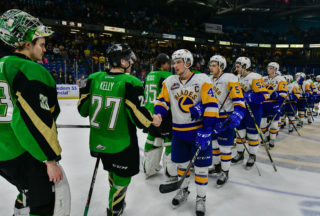 By the time all was said and done, Dach had tallied 10 points (six goals, four assists) in 19 games with the Blades, while also being part of a tense last-minute playoff push. “When it comes down to that time it’s do-or-die for some teams and I think this year it’ll help me be more mentally prepared for what’s to come at the end of the year,” he said. 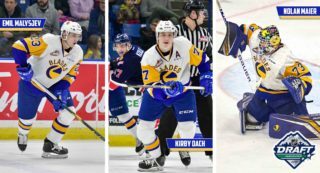 While Dach and the Blades fell just shy of the final Wildcard spot in the Eastern Conference, the self-described playmaking forward said he has high hopes for what the future holds. “We’re a young team and I think we’re just turning the corner to what could be a couple of successful years for us in the playoffs and hopefully make a championship run,” he said. Dach, who likes to model his game after Chicago Blackhawks star Jonathan Toews, added that he’s going to do whatever it takes to help the team get to that point in the coming years. 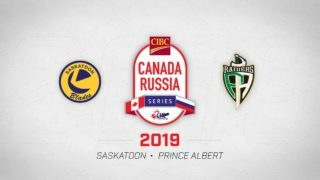 Over the off-season, the 16-year-old rookie has been spending the vast majority of his time in the gym and on the ice, trying to get stronger and faster so that he can keep up with the intensity of the WHL game. Dach and the Blades kick off the 2017-18 WHL season on Sept. 22 when they play host to the Swift Current Broncos at the SaskTel Centre. Puck drop on that game is at 7:05 p.m. MDT.